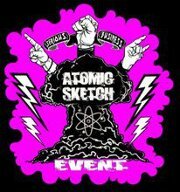 Atomic Sketch Event and Art Opening! Atomic Sketch Event (ASE) along with the Green Eye Lounge, is proud to present a new show by Kelly D. Pelka. The show, entitled “i might help you or i might let you down…” will open on Thursday, January 31, 2013, from 6-11pm and run until the end of March. This entry was posted in Art Shows, Uncategorized. Bookmark the permalink. Post a comment or leave a trackback: Trackback URL.